For many Christian denominations, the doctrine of the fall is closely related to that of original sin. They believe that the fall brought sin into the world, corrupting the entire natural world, including human nature, causing all humans to be born into original sin, a state from which they cannot attain eternal life without the grace of God. The Eastern Orthodox Church accepts the concept of the fall but rejects the idea that the guilt of original sin is passed down through generations, based in part on the passage Ezekiel 18:20 that says a son is not guilty of the sins of his father. Calvinist Protestants believe that Jesus gave his life as a sacrifice for the elect, so they may be redeemed from their sin. Judaism does not have a concept of "the fall" or "original sin" and has varying other interpretations of the Eden narrative. Lapsarianism, the logical order of God's decrees in relation to the Fall, is the distinction, by some Calvinists, as being supralapsarian (antelapsarian, before the Fall) or infralapsarian (sublapsarian, postlapsarian, after the Fall). The doctrine of the fall of man is extrapolated from Christian exegesis of Genesis 3. According to the narrative, God creates Adam and Eve, the first man and woman. God places them in the Garden of Eden and forbids them to eat fruit from the tree of knowledge of good and evil. 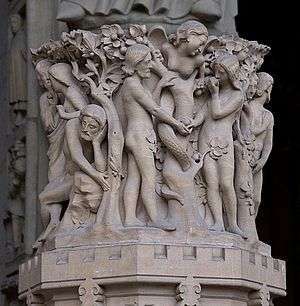 The serpent tempts Eve to eat fruit from the forbidden tree, which she shares with Adam and they immediately become ashamed of their nakedness. Subsequently, God banishes Adam and Eve from the Garden of Eden, and places cherubim to guard the entrance, so that Adam and Eve will not eat from the "tree of life". The Book of Jubilees gives time frames for the events that led to the fall of man by stating that the serpent convinced Eve to eat the fruit on the 17th day, of the 2nd month, in the 8th year after Adam's creation (3:17). It also states that they were removed from the Garden on the new moon of the 4th month of that year (3:33). Christian exegetes of Genesis 2:17 ("for in the day that you eat of it you shall die") have applied the day-year principle to explain how Adam died within a day. Psalms 90:4, 2 Peter 3:8 and Jubilees 4:29–31 explained that, to God, one day is equivalent to a thousand years and thus Adam died within that same "day". The Greek Septuagint, on the other hand, has "day" translated into the Greek word for a twenty-four-hour period (ἡμέρα, hēméra). Catholic exegesis of Genesis 3 claims that the fall of man was a "primeval event, a deed that took place at the beginning of the history of man." This first sin was "transmitted" by Adam and Eve to all of their descendants as original sin, causing humans to be "subject to ignorance, suffering and the dominion of death, and inclined to sin." Baptism is considered to erase original sin, though the effects on human nature remain, and for this reason the Catholic Church baptizes even infants who have not committed any personal sin. Although the state of corruption, inherited by humans after the primeval event of Original Sin, is clearly called guilt or sin, it is understood as a sin acquired by the unity of all humans in Adam rather than a personal responsibility of humanity. Even children partake in the guilt or sin of Adam, but not in the responsibility of original sin, as sin is always a personal act. Traditionally, the fall of Adam and Eve is said to have brought “four wounds” to human nature. These are enumerated by St Bede and others, especially St Thomas Aquinas (STh I-II q. 85, a. 3) They are Original sin (lack of sanctifying grace and original justice), Concupiscence (the soul's passions are no longer ordered perfectly to the soul’s intellect), Physical frailty and death, and a darkened intellect and ignorance. These negated or diminished the gifts of God to Adam and Eve of original justice or sanctifying grace, integrity, immortality, and infused knowledge. Eastern Orthodoxy rejects the idea that the guilt of original sin is passed down through generations. It bases its teaching in part on Ezekiel 18:20 that says a son is not guilty of the sins of his father. The Church teaches that, in addition to their conscience and tendency to do good, men and women are born with a tendency to sin due to the fallen condition of the world. It follows Maximus the Confessor and others in characterising the change in human nature as the introduction of a "deliberative will" (θέλημα γνωμικόν) in opposition to the "natural will" (θέλημα φυσικόν) created by God which tends toward the good. Thus, according to St Paul in his epistle to the Romans, non-Christians can still act according to their conscience. Orthodoxy believes that, while everyone bears the consequences of the first sin (that is, death), only Adam and Eve are guilty of that sin. Adam's sin isn't comprehended only as disobedience to God's commandment, but as a change in man's hierarchy of values from theocentricism to anthropocentrism, driven by the object of his lust, outside of God, in this case the tree which was seen to be "good for food", and something "to be desired" (see also theosis, seeking union with God). In Gnosticism, the snake is thanked for bringing knowledge to Adam and Eve, and thereby freeing them from the Demiurge's control. The Demiurge banished Adam and Eve, because man was now a threat. In Islam, Adam and his wife were misled by Shayṭān, who tempted them with immortality and a kingdom that never decays, saying: "Your Lord only forbade you this tree, lest ye should become angels or such beings as live for ever". Adam and Eve had been warned of Shayṭān's scheming against them, and had been commanded by God to avoid the tree Shayṭān referred to. Although God had reminded them that there was enough provision for them "not to go hungry nor to go naked, nor to suffer from thirst, nor from the sun's heat", they ultimately gave in to Shayṭān's temptation and partook of the tree anyway. Following this sin, their "nakedness appeared to them: they began to sew together, for their covering, leaves from the Garden", and were subsequently sent down from Paradise onto the earth with "enmity one to another". However, God also gave them the assurance that "when there come unto you from Me a guidance, then whoso followeth My guidance, he will not go astray nor come to grief." In classic Zoroastrianism, humanity is created to withstand the forces of decay and destruction through good thoughts, words and deeds. Failure to do so actively leads to misery for the individual and for his family. This is also the moral of many of the stories of the Shahnameh, the key text of Persian mythology. The Alawites believed that they were once luminous stars worshipping ʿAlī ibn Abī Ṭālib in a world of light, but that upon committing sins of pride they were banished from their former state and forced to transmigrate in the world of matter. 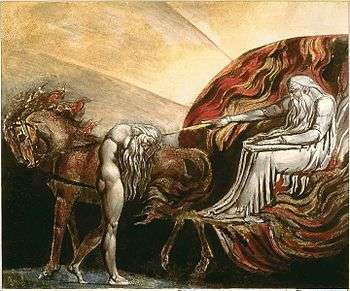 William Blake's color printing of God Judging Adam original composed in 1795. This print is currently held by the Tate Collection In the Biblical story, God's judgement results from the fall of man. In William Shakespeare's Henry V (1599), the King describes the betrayal of Lord Scroop – a friend since childhood – as being "like another fall of man", referring to the loss of his own faith and innocence the treason has caused. In the novel Perelandra (1943) by C. S. Lewis, the theme of the fall is explored in the context of a new Garden of Eden with a new, green-skinned Adam and Eve on the planet Venus, and with the protagonist - the Cambridge scholar Dr. Ransom - transported there and given the mission of thwarting Satan and preventing a new fall. In the novel The Fall (1956) by Albert Camus, the theme of the fall is enunciated through the first-person account given in post-war Amsterdam, in a bar called "Mexico City." Confessing to an acquaintance, the protagonist, Jean-Baptiste Clamence, describes the haunting consequence of his refusal to rescue a woman who had jumped from a bridge to her death. The dilemmas of modern Western conscience and the sacramental themes of baptism and grace are explored. J. R. R. Tolkien included as a note to his comments about the Dialogue of Finrod and Andreth (published posthumously in 1993), the Tale of Adanel that is a reimagining of the fall of man inside his Middle-earth's mythos. The story presented Melkor seducing the first Men by making them worship him instead of Eru Ilúvatar, leading to the loss of the "Edenic" condition of the human race. The story is part of Morgoth's Ring. In both Daniel Quinn's Ishmael (1992) and The Story of B (1996) novels, it is proposed that the story of the fall of man was first thought up by another culture watching the development of the now-dominant totalitarian agriculturalist culture. In Philip Pullman's His Dark Materials series (1995, 1997, 2000), the fall is presented in a positive light, as it is the moment at which human beings achieve self-awareness, knowledge, and freedom. Pullman believes that it is not worth being innocent if the price is ignorance. The novel Lord of the Flies explores the fall of man. The storyline depicts young innocent children who turn into savages when they are stranded on a desert island. Lord of the Flies was originally named Strangers from Within, also showing his views of human nature. ↑ "CATHOLIC ENCYCLOPEDIA: Adam". www.newadvent.org. Retrieved 2016-04-12. ↑ Kugel 1998, p. 50-1. ↑ Q & A – Original Sin. OCA. Retrieved on 2011-10-30. ↑ Eastern Orthodox Catechism, published by the Russian Orthodox Church. Accessed February 16, 2008. ↑ Olsson, Tord; Özdalga, Elisabeth; Raudvere, Catharina, eds. (1998). Alevi Identity: Cultural, Religious and Social Perspectives. England: Routledge. pp. 214–215. Kugel, James L. (1998). Traditions of the Bible : a guide to the Bible as it was at the start of the common era. Cambridge, Mass. [u.a. ]: Harvard University Press. ISBN 9780674791510. Thompson, William Irwin, The Time Falling Bodies Take to Light: Mythology, Sexuality and the Origins of Culture, 1981, 2001 ISBN 0-312-80512-8. Wikimedia Commons has media related to The Fall. Koran, The. "Koran: The Elevated Places". Adam and his wife in Al-Quran at www.quod.lib.umich.edu. LDS, The Church of Jesus Christ of Latter-day Saints (LDS Church) (2012). "The Fall of Man in the Book of Mormon: 2 Nephi 2". Book of Mormon at www.lds.org.